Find out more and apply at www.summerjobsthatmatter.org. We’ll be on your campus 4/29 – 5/1, call us at 1-800-75-EARTH to schedule an interview. The Fund for the Public Interest is seeking hard-working individuals with a passion for social change to fill citizen outreach and Field Manager positions across the country this summer. We are hiring full-time staff, with leadership opportunities available, with offices in over 25 cities across the country this summer, to work on issues like stopping plastic pollution, or getting pesticides out of our food supply. The Michigan Department of Natural Resources has an opportunity for an analyst to coordinate forest planning efforts for the 4-million acre state forest system in Michigan. The position advertisement closes on April 14, 2019. The Michigan Department of Natural Resources is currently recruiting a limited term Forest Management Specialist 13 (Forest Planning and Modeling Specialist) in the Forest Resources Division. This position is located in Lansing, Michigan. The position is open to all applicants. Interested applicants must apply through NEOGOV. Work for the College of the Environment Dean’s Office! Have you ever wondered how to become more involved with the College of the Environment? Have you ever wondered what it would be like to plan a large event? Would you like to learn more about environmental careers and how to find a job in your field? Do you want to help prospective students learn about College of the Environment programs? Then this opportunity might be for you! The College of the Environment Academic Affairs office is hiring for two part-time program assistants. Below is the position description. Follow this link to apply online via HandShake. The deadline to apply is April 19th, 2019 at 12 PM. Primary duties of the Student Career Services & Academic Affairs assistant include managing the College of the Environment Career Opportunities Page, coordinating the Undergraduate Student Ambassador Program and related recruitment activities and events, and assisting in the management, planning, and execution of events. The student assistants play a key leadership role in organizing two major annual events: the Environmental Career Fair and Future Student Visit Day. Student Assistants are invited to serve as an Undergraduate Student Ambassador, but are not required to do so. Candidates should have a genuine interest in the College’s focus on environment, sustainability, and conservation and specifically be interested in environmental career pathways and/or career services. Candidates must have excellent written and oral communication skills, excellent attention to detail, organizational skills, and ability to prioritize several competing tasks and projects. In addition, candidates must be comfortable with computers, work well as a member of a team, communicate effectively with colleagues, exercise good judgment, be open to learning new skills, and meet deadlines. Comments Off on Work for the College of the Environment Dean’s Office! Please post the following link for our seasonal GIS position. Thank you! Please see the information below regarding a potential opportunities for SEFS graduates or current students with qualifications. This is short notice. I’ve linked the position description: https://www.peacecorps.gov/volunteer/response-openings/forest-management-specialist-5678br/. A Forest Management Specialist fluent in Spanish and experienced in agroforestry practices and monitoring and evaluating forest restoration is needed to train farmers in wood handling techniques. The Despertar Campesino Cooperative, a local farmer association, was managing an agreement for the exploitation of Caribbean pine for almost 8 years with the Ministry of the Environment where the objective was to do forest management of the wood plantation and that this was used for the manufacturing of furniture and sale of clean wood. One of the weaknesses of the Cooperative was that it didn’t have the necessary tools to make the most of it. The interest of the Cooperative is to implement techniques, harvesting tools and a better plan for the sustainable use of the plantation with the support of the Peace Corps Response Volunteer (PCRV). Through the technical support of the Volunteer, members of the cooperatives and managers can be better trained to manage the forestry project that would benefit the cooperative and its associates, as well as the community in general. The Forest Management Specialist will train and advise Cooperative staff and partners in charge of the project in techniques and strategies to take advantage of trees in the best way, and thus obtain better income for the organization to continue and expand the social projects of the organization and local communities. The goal of this assignment is for the PCRV to train partners, including designing an operational manual, and creating a record for wood extraction and processing. I’m looking for applicants ASAP, with a closing date of April 3. A candidate must be selected before April 14. Thank you so much for your help. Please let me know if you need additional information. Also, one of my colleagues is recruiting for two positions in Peru, if you’re able to post those as well. Her closing date is April 26. 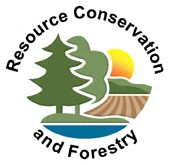 Attached is a posting for a Forest Technician position currently open with Pennsylvania’s Department of Conservation and Natural Resources (DCNR), with application closing date of April 4, 2019. Penn Nursery is in Centre County, right outside State College (Penn State University), PA. Please share with alum and graduating seniors in your forestry programs and encourage them to apply. This is a full-time, seasonal position with a starting salary of $37,986.00. Also included in this email is a map of PA Counties and Forest Districts, so applicants can visualize the location of the opportunity, and instructions on how to apply. The Snoqualmie Ranger District is seeking one Visitor Information Assistant for year-round, permanent part time work, as part of a shared position which staffs the Visitor Information Center in the Enumclaw, Washington office. About the Position – The position is permanent part time at 32 hours per pay period (two weeks) per incumbent. A uniform is required. The work schedule may include weekends and holidays. The incumbent will be a member of a dynamic organization which strives to provide quality and efficient customer service to visitors of the Mt. Baker-Snoqualmie National Forest. Primary duties include responding to visitor inquiries, verbally and in writing, about recreation opportunities in the National Forests. Explains rules relating to National Forest programs and activities, including wilderness, and to educate and gain visitor cooperation in protecting forest resources from fire, vandalism, stream pollution and litter. Other duties include managing a small book and map sales outlet, issuing permits, maintaining information displays and bulletin boards, and monitoring the district radio traffic. Incumbent may occasionally be involved in environmental education programs for school and community groups. Knowledge of Forest Service programs, policies and procedures, and outdoor recreation activities in the National Forests, such as camping, hiking and winter snow play, will be helpful. Skill in communication (oral and writing), research techniques, public speaking, and computers is important. About the Mt. Baker-Snoqualmie National Forest – The Mt. Baker-Snoqualmie National Forest in Washington State extends over 140 miles along the western slopes of the Cascade Mountains from the Canadian border south to Mt. Rainier National Park. The Forest covers portions of Whatcom, Skagit, Snohomish, King and Pierce Counties in which over 55 percent of the state’s total population resides. Nearly three million people in or near the Puget Sound metropolitan area are 40 to 70 miles west of the Forest boundary. This, coupled with the fact that four major mountain passes cross the Cascade Mountains through the Mt. Baker-Snoqualmie National Forest, makes it one of the most visible and visited National Forests in the country. Its permanent and seasonal employees are responsible for managing 1.7 million acres of public land. The Forest Headquarters is located in Everett, Washington. The four Ranger Districts, from north to south, are the Mt. Baker, Darrington, Skykomish, and Snoqualmie. The Forest also operates an Outdoor Recreation Information Center in the REI flagship store in downtown Seattle in partnership with the National Park Service. Visitor information centers at Snoqualmie Pass and Heather Meadows, and public service centers in Verlot and Glacier are also open on a seasonal basis. The Snoqualmie Ranger District is the southernmost district on the Mt. Baker-Snoqualmie National Forest. It is located directly east of Seattle adjacent to rapidly developing suburban areas. The northern half of the district is very steep and rugged, while the southern half has a bit gentler terrain. The district contains over 500,000 acres within its administrative boundary. The heaviest recreational use of the lands within the district is along the I-90 corridor. Several million vehicles travel this route every year, and many visitors take advantage of the easy accessibility of recreational opportunities here. Within this corridor are three developed campgrounds, two picnic areas, ten trailheads, four distinct ski areas, cross-country skiing, and much more. About 81,000 acres of the Alpine Lakes Wilderness is managed by the Snoqualmie Ranger District, including the upper watersheds of the North, Middle, and South Forks of the Snoqualmie River. The Snoqualmie Ranger District/Enumclaw office is located on the south end of the district off Highway 410, bordering Mt. Rainier National Park on its north and west sides, and defines the south end boundaries of the Mt. Baker-Snoqualmie National Forest. Within this area, there are several trailheads and two more campgrounds (Silver Creek and Dalles) as well as the Evans Creek Campground off of Hwy 165, also the only Off Road Vehicle (ORV) area on the entire forest. All of these developed recreational areas, on the south end, are managed from the Enumclaw office. This part of the district boasts some of our nation’s premier sales of Christmas trees averaging over 2,500 permits per year. There are three operating lookouts located on the Snoqualmie Ranger District, two of them managed through the Enumclaw office. They are manned by trained volunteers during the fire season (typically June through late September). Crystal Mt. Ski Resort is within the forest boundaries, just off Hwy 410. The Snoqualmie Ranger District is a highly visible and rapid-paced place to work. The heavily used I-90 corridor and the Alpine Lakes Wilderness, coupled large domestic watersheds, concentration of ski areas, ORV area, and trail system provide a unique combination of challenging and interesting outdoor experiences in our beautiful forest. Suggest applicants live within a thirty mile commute to the duty station. For more information, please contact Linda N. Shaffer, Administrative Support Coordinator at linda.shaffer or by telephone at 360-802-5306. This is a “generalist” position with “boots on the ground” and hopefully dealing with all aspects of the City’s forest landscape. Are you looking for an on-campus job? Do you have a passion for teaching? Do you like helping others? If so consider applying to one of our CLUE Tutor positons. We are hiring for a wide range of subjects including Math, Writing, Chemistry, Physics and Front Desk Manager. 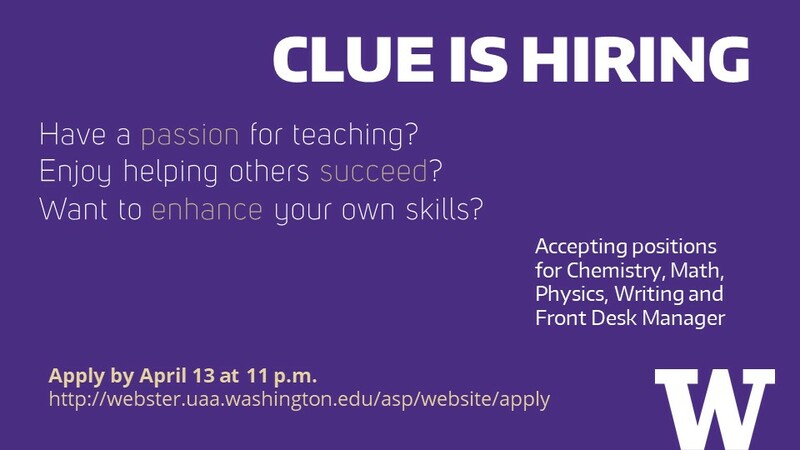 To apply go to our website https://webster.uaa.washington.edu/asp/website/ or apply on Handshake. Applications close on April 13th. The Okanogan-Wenatchee National Forest is located in the State of Washington and is seeking qualified applicants to fill multiple, permanent, full-time positions. These positions offer a unique opportunity for career development, while providing support to a fast paced, team oriented, high producing staff. The Vacancy announcements will be posted to www.USAJobs.gov in the near future. The purpose of this Outreach Notice is to determine the potential applicant pool for the position described and to establish appropriate recruitment methods and areas of consideration (e.g. agency-wide, government-wide, DEMO, or non-competitive) for the vacancy announcement. If you have questions about the positions duties or duty location, please contact the POC listed for that position. If transfer of station benefits (TOS) are offered, the vacancy announcement, once posted, will specify the available benefits. Please see below or attached for a listing of the many opportunities the Okanogan-Wenatchee intends to fill in 2019. Due to the new hiring database, some opportunities will be advertised shortly, while others may be advertised a few months later. Please help us spread the word about these opportunities. These positions will be announced on USA Jobs in the near future. Tips on writing a resume and applying for federal jobs can be found at https://www.usajobs.gov/Help/how-to/. Responding to this outreach does not constitute an application. The vacancy announcement will appear on the USA Jobs website. The Career & Internship Center has just opened applications for our spring quarter company site visits. All current UW Seattle undergraduate students are welcome to apply. Please don’t hesitate to contact ccsevent with questions. Thanks! The Odegaard Writing & Research Center (OWRC) is now hiring for multiple hourly student positions for the 2019-2020 academic year. If you or your colleagues know someone who might be both interested in and qualified to apply for work as a peer writing tutor or Student Program Assistant at the OWRC, please feel free to share the following link (https://depts.washington.edu/owrc/hiring) and encourage them to apply on Handshake. Our tutors are undergraduate and graduate students from a wide range of academic fields, and we provide a rich learning environment for writers and tutors alike. We consistently hear from tutors that their work here is challenging and transformative. Our Student Program Assistant is an undergraduate or graduate student from any academic field, who assists with the day-to-day operations of the OWRC, including office and programmatic support. While this is not a peer writing tutoring position, we still seek applicants who demonstrate reflection, metacognition, and empathetic listening. Applications for both positions are due on Monday, April 8 at 11:59 pm. Students can learn more about working in the OWRC by attending our information sessions (see flyer). We also encourage applicants to to bring their materials to the OWRC and discuss them with our current tutors—just make an appointment and come by.